That's what my "faux-bro" Jon kept telling us as we hiked thru Forest Park for 3 miles this afternoon! Anyway, let's back up a minute - we started off the day by Laura and I riding the Metrolink to Union Station to meet up with Julie, Carla, Mike, Jon, Joe, and 20 other McGinnis family members. Upon arrival Laura and I proceeded to get our 1st "green beers" which were really just dyed Bud Lights. I was on a quest for a Yard-O-Beer, but they weren't selling them, so the 32 oz of green beer would have to do for the time being. Then we all headed up to the parade route and watched all the marching bands, floats, Irish cloggers, etc pass by then it was time to fight the crowds for a potty break inside of Union Station. 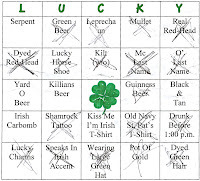 We were also playing LUCKY, which is my version of an Irish Bingo game, throughout the day. We all managed to win I believe, here is my card! Julie bet me to ask 3 guys wearing kilts if they were wearing underwear and I did, so Juls you owe me $5.00!!! We all went to Houlihan's for lunch, where we saw an Irish Flav-a-flav, and I again asked for the Yard-O-Beer but no luck. After lunch, we all headed over to Jon's place, which was only "1 mile" from the Forest Park Metrolink stop, so Jon's says!!! However, after about an hour of walking we realize this 1 mile was more like 3, but we finally made it and hung out over there for a bit. Jon made this really good granny smith infused vodka that we put with Sprite. Though, it sorta looked like pee in a jar, it tasted really great! Then Carla, Mike, Julie, Laura, and I headed to Pat's Bar for dinner. They had 1/2 fried chicken with fries for only 5 bucks today! What a deal! Also, no Yard-O-Beer :( Apparently you have to buy the cups at Walgreens or wherever and just fill them with beer. I will be more prepared next year and bring my own Yard-O-Beer cup. I also have quite a collection of green beads, shot glasses, etc from today! At last it was time to go home, Kate (Laura's sister) was kind enough to drive us to the nearest Metrolink station so we wouldn't have to hike back thru Forest Park in the dark! Julie had been talking about ice cream for a little while during dinner, so Laura and I took her advice and headed up to Sheridan's Frozen Custard for a little St. Paddy's day treat. I happened to look inside and see my old neighbor Cathy, whom I see in totally random places all the time! All in all it was an awesome day and I'm really glad I got to go and I'm already looking forward to next year and my Yard-O-Beer.